Image database management for Windows. Our software helps you create and manage all kinds of digital image, digital photo, and graphic catalogs. Photo Organizer's intuitive interface and ready-to-use image database management solutions make it easy to set up and use. Picture Organizer Basic: organize and maintain all your digital pictures and photos in a general form. 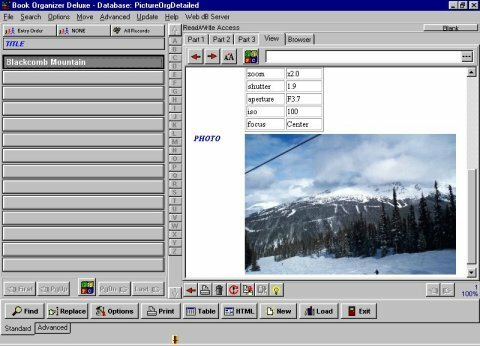 Picture Organizer Detailed: complete template that allows you to catalog and maintain detailed information about all digital pictures and photos. Multimedia Organizer: solution that allows you to organize and maintain all your multimedia files using specialized table field. Using a helper program called Designer you can create or modify image inventory solutions that you define. Our image manager comes with flexible features such as: Access your data in a variety of ways (database table viewer, detail record viewer, and customized html viewer). Create quality, professionally looking documents, image reports, image html reports, image catalogs with color and graphics. Print customized forms or any mail merge documents. Easily generate data specific commands: with one click send email message, capture or enter an image, ... Program is network compatible. Set it up on the server computer and share image databases among all users on your network. There are additional specialized database management solutions that could be easily imported to the program through the Internet, example: address organizer with a person image field, product catalog with multiple product images, car sales manager with car images. Ordering is risk-free: 30-day money back guarantee. Soft4Boost Audio Studio 5.1.9.241: Edit your audio collection with Soft4Boost Audio Studio. Soft4Boost Ringtone Creator 6.9.1.217: Create own ringtones to cell and mobile device with Ringtone Creator! AhaView 4.54: Browse, view, organize and convert your digital images with AhaView A-PDF Restrictions Remover 2.8.5: Remove password and restrictions of PDF files in a few seconds.